Ocean conditions to the north of the UK are among the harshest on the planet, with ultra-deep waters, powerful winds and vast waves. It’s a region that has inspired engineers from Great Britain and beyond to battle the extreme offshore environment to reach the resources beneath the seabed. Thanks to remarkable technological breakthroughs and dogged determination, BP and its partners have succeeded in bringing onstream a complex section of the biggest field on the United Kingdom Continental Shelf (UKCS) – some 40 years after it was discovered and considered too difficult to develop. The Clair Ridge platform is now producing oil from the giant Clair field – a massive oil reservoir discovered in 1977. Geologist Bill Senior, who was part of the original discovery team, remembers those early days west of Shetland. Twenty-two years old and despatched from London to Aberdeen with the ink barely dry on his geology degree, Senior was in charge of instructing drillers where to target oil. “My first well, the first we drilled west of Shetland, ended up being the 206/81-A discovery, what we know now as Clair,” he says. Undeterred by the seemingly-impossible challenge, however, Senior, his colleagues and subsequent teams tried to figure out how to turn this remarkable discovery into a producing field. It would take 24 years and much frustration until, finally, in 2001, BP and its partners approved a plan for the first phase of development of the Clair field. Once moving, though, development turned out to be relatively fast, with Phase 1 coming onstream in 2005, targeting approximately 300 million barrels of recoverable resources. The original Clair platform was the first offshore facility to be fixed to the seabed in the harsh west of Shetland area. Phase 2 – Clair Ridge – is located north of Phase 1, with two bridge-linked platforms that are targeting 640 million barrels of recoverable resources. The man responsible for hitting the green light on the project’s first oil is North Sea regional president Ariel Flores, who was just seven months old in 1977, when the Clair field was discovered. It’s a responsibility he carries willingly. The construction of Clair Ridge, however, stretched far beyond UK waters, with the jackets fabricated in Norway and the topsides in South Korea, before being transported by sea for installation west of Shetland. In the summer of 2015, following their epic journey of 91,000 nautical miles to the North Sea, the first topsides were safely manoeuvred into position to form the workers’ accommodation. A year later, and taking advantage of a rare four-day spell of calm weather, the team used two formidable heavy-lift cranes to install the topsides for the drilling and production platform. The years of hard work have paid off with the Clair Ridge project now supplying the UK with a major new source of oil. With such expectation riding on its shoulders, it’s no wonder that the Clair Ridge project has been built to last. Thanks to a capital investment in excess of £4.5 billion, two new bridge-linked platforms and new export pipelines are expected, at peak, to supply 10% of the UK’s oil production, while also supporting jobs for years to come and showcasing the best of what offshore UK engineering has to offer. The Clair Ridge platform is now producing oil from the giant Clair field – a massive oil reservoir discovered in 1977. So, what was it that made the difference? What turned Clair from a maddeningly uneconomic daydream into a bona fide powerhouse? The answer, says Senior, is technology. After the 1977 discovery, Clair could not be forgotten – its potential was too great. But, it would take some time before the technology was developed that could unlock the complex rock structures holding all the oil. Thanks to advanced seismic imaging, the team could better pinpoint those fractures and, with the use of pioneering horizontal drilling, they could finally access them. Drilling wells horizontally through the reservoir greatly increases the chance of intersecting the natural fractures and accessing larger volumes of hydrocarbons. And it was this that unlocked the Clair area by providing confidence it could be a commercial success. Technology has played a massive role in turning this discovery into a reality. It is now playing a major role in revitalizing production, thanks to the first offshore deployment at Clair Ridge of BP’s enhanced oil recovery technology, LoSal®, which seeks to increase oil recovery from reservoirs by using reduced-salinity water in water injection. This has the potential to result in up to 40 million additional barrels being cost-effectively recovered over the lifetime of the development. Ridge is also a showcase for the latest advances in UK engineering. Indeed, 71 out of the 122 project contracts were delivered in Britain, amounting to an overall investment in UK suppliers of £1.5 billion. With the facility built to last another four decades, it also promises to support hundreds of jobs in the region for many years to come. With installation complete, there followed one of the biggest ‘hook-up operations’ the North Sea had ever seen, with 750 people offshore each day welding, readying the platform for first oil. 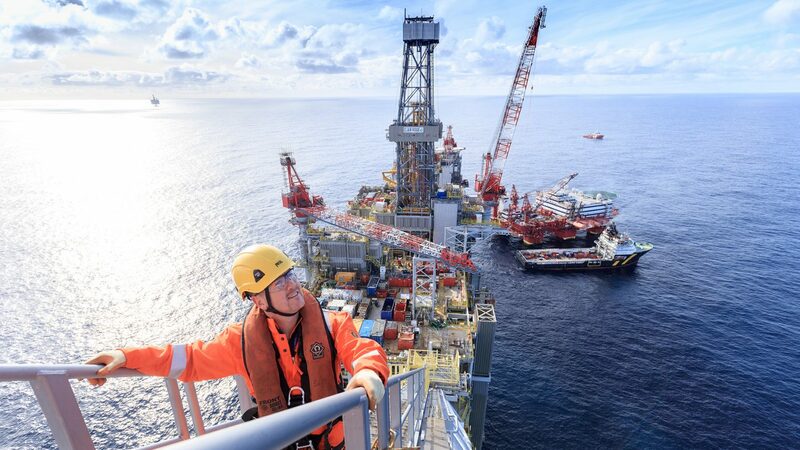 “The hook-up campaign, involving 10 million hours worked, was probably one of the biggest in the North Sea in the past 20 years,” says Cathal Kelly, vice president of BP’s Global Project Organization (GPO) for Clair Ridge. The years of hard work and ingenuity came to fruition in 2018, when Clair Ridge was brought onstream. On 23 November 2018, Clair Ridge began producing oil – the culmination of hard work, skill and dedication on a truly global scale. It’s a major milestone in the west of Shetland that will have strategic importance for BP and the region for many years to come.